The first thing you really notice about the reboot film in the Planet of the Apes franchise is the incredible makeup, especially when you think back to the Charlton Heston 1968 movie. The apes are are so realistic, you can practically smell them. The screenplay by Mark Bomback, Rick Jaffa, Amanda Silver follows the events after the 2011 film Rise of the Planet of the Apes. Director Matt Reeves infuses the film with a more personal sense of family values for humans and apes in a post apocalyptic world where peace between the species is but a hopeful dream. The film opens with a quick summary of what happened after the apes escaped the lab in San Francisco and the virus wiped out most of the world's population of humans. 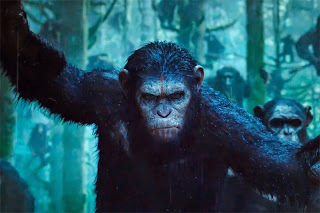 The apes lead by Caesar (Andy Serkis) has established a community where all the apes are thriving. But the peace is disrupted when his son and friend are shot at by Carver (Kirk Acevedo) a very nervous human who fears the apes as the carriers of the virus. Of course, his fears are unfounded. Humans created the virus. But that shot is the catalyst for the coming confrontation between humans and apes. The human Malcolm (Jason Clarke) tries to reason with Caesar to let them work on the dam in their territory to bring power to the settlement of surviving humans living in San Francisco. He and his friend Dreyfus (Gary Oldman) help establish the enclave but they are running low on resources and they need the power to continue. The apes don't trust the humans especially Koba (Toby Kebbell) who suffered from the experiments done to him as a lab animal. His opinions are strengthened when the apes confront the humans in the city with guns pointing at them from the fortified walls. Caesar surprises them when he speaks and the humans realized they may be better armed, but they are sorely outnumbered. Malcolm and Caesar managed to come to an agreement about fixing the dam as long as they leave each other in peace afterwards. Unfortunately Dreyfus thinks they are "just" animals and gathers the armaments left behind by FEMA to defend themselves. The conflicts with the humans and apes are pretty broadly drawn. While Malcolm and Caesar are able to establish a growing respect for each other by their mutual sense of family, they are undermined by their counterparts who can't think beyond their fear and prejudice. It's kind of disheartening to think that even at the end of the world people will still try to kill each other for their beliefs. The film is colored in deep tones of the wet forests of Northern California, even the city is overcast within it's ruins. It sets off the visual details of the characters that are captured in the close ups of the ape faces that are intense, dangerous and eloquent. The non-verbal exchanges of the apes are subtitled as most of the apes use sign language learned from their time in the labs. Keri Russell who plays Malcolm's wife and Kodi Smit-Mcphee who plays Malcolm's teen son offer a poignant touch to the story. With all the blockbuster movies out there with things going boom without substance, this is a nice and satisfying film that still has the obligatory action sequences, but also gives one something to think about later.